The 28-year-old has just 15 months remaining on his current deal with the Blues, and this has intensified the talk of him pursuing his dream move to the European champions. According to The Independent, Los Blancos are moving closer to securing a transfer agreement after agreeing terms with the player regarding a summer switch to the Bernabeu. However, they still have to agree on a transfer sum with the Blues and that could remain tedious with the west London side reluctant to sell their forward for anything less than £100m. 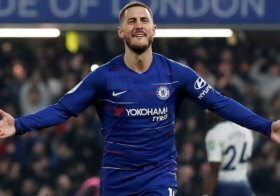 Hazard is currently going through his best-ever campaign in the English top-flight and he has notched a combined 26 goals and assists from just 31 appearances for the Blues. The Belgian is expected to feature for the Blues on Monday night where they take on West Ham United at the Bridge. The game remains a must-win in the club's pursuit of the top four in the Premier League.